Whilst many people are familiar with the work of Archibald McIndoe within the field of plastic surgery, few people are aware of part that East Grinstead plays within the history of eye surgery, especially with the setting up of eye banks. The most important person behind this story was Sir Benjamin Rycroft, who worked at the Queen Victoria Hospital after the end of the Second World War. Rycroft was born in 1902, and trained as an ophthalmologist (a doctor who specialises in working with the eyes). When war broke out in 1939, he joined the Royal Army Medical Corps, serving as an adviser in ophthalmology to the Army in both North Africa and Italy. For his work during the war he was awarded an O.B.E. 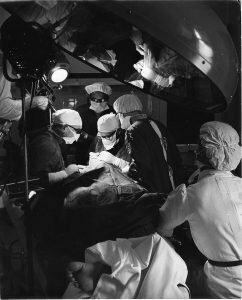 By 1949, Rycroft started working in a new Corneo-Plastic Department at the Hospital, which was set up with ten beds and an Ophthalmic Sister to assist with his work. Despite the increased publicity for his work, Rycroft was affected by a lack of donors for any procedures largely due to restrictive laws on the donation of body parts for medical purposes. These laws placed the decision for donation with the person’s next of kin, ignoring the donor’s wishes, as in law, the dead body has no property. On 11th December 1951, a meeting was held at the hospital, which included local politicians from both major parties. to hear Rycroft and Sir Archibald McIndoe talk about the need for donor eyes for the unit. Rycroft was quoted as saying “We have all the facilities we require here at this hospital, but there remains a problem of donor eyes; our list grows week by week”. Immediately after the meeting, a campaign designed to raise awareness and change law was launched. 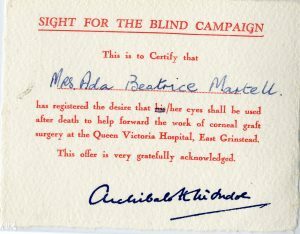 Named the “Sight for the Blind” Campaign, it worked with the Women’s Voluntary Service to distribute forms to people who wanted to have their eyes for corneal grafting. Anyone who signed up received a card signed by McIndoe. The publicity from the meeting, and the campaign led to the creation of a private members bill in Parliament in May 1952, and by September it had become law. This removed much of the legal problems for people wishing to donate their eyes for medical reasons. It also set up Eye Banks to help store and use these donated eyes, and the first was set up at the Queen Victoria Hospital. In fact, it is widely remembered by Hospital staff that a train carriage, containing the donated eyes used to arrive in East Grinstead Station and were taken by taxi to the Hospital. 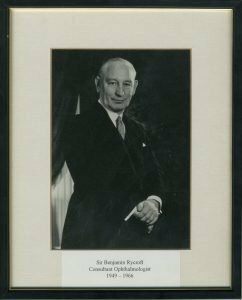 Rycroft was knighted for his work in 1960, but he passed away in 1967. An image of an operation in progress with Sir Benjamin Rycroft operating. 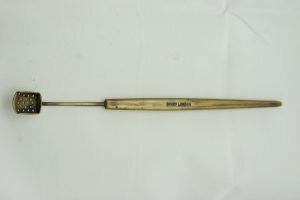 Corneal shovel designed by Sir Benjamin Rycroft. Used for transfering the cornea disc from donor to patient after the removal from the donor eye during cornea transplant surgery. 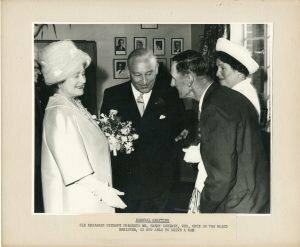 Sir Benjamin Rycroft introducing Mr Harry Coveney to HRH Queen Elizabeth the Queen Mother. Thanks to Rycroft’s work, Coveney was able to drive a car. This story was told using research from the Museum’s collections. To see more of the collections, and to find out more forgotten stories, please visit our online collections. Truly a forgotten story and one which is deservedly given profile here. East Grinstead has reason to be proud of its history as a centre of medical innovation. ago I regret I did not know there is a museum there,in which he rightly features. My father, brilliantly talented though he was ,was also very modest and never sought the limelight or publicity for himself. He was extremely kind to everyone and a loving and wonderful father and I miss him greatly and always will. I well remember our trips down to East Grinstead on Christmas Days when he would take the family to help feed the blind patients who were too ill to go home. The nurses had decorated the wards with lots of colourful Christmas things and we would try to describe it all for the patients,while my father visited every one throughout his wards,usually accompanied by the very special Sister King,who had also been his theatre Sister during the war. They were a great working team. and so much good work still to accomplish. He was dedicated to his patients and to his family and i am so pleased that his memory lives on at the Museum. East Grinstead,Moorfields and the London Clinic. My brother was also very much involved with the Eye Bank Project,which he helped to set up with our father. Tragically he died in a mysterious motoring accident on the M4 a year after my father passed away and just before he was due to take over father’s practice. A second great loss for their patients and another successful career cut short when they had so much more to offer and discover. different,make your own way, otherwise,as a surgeon, you will always be your father’s son !” Still,that didn’t seem such a bad thing to be and I’m very proud that I am. 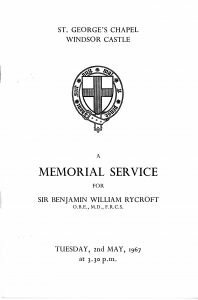 Does anyone know who Benjamin Rycrofts nurse was please ? Sir Benjamin Ryecroft operated on my eye in when I was admitted as a road traffic accident way back in 1965. alongside Mr white, a consultant and to both I am eternally grateful as although my sight could not be saved they ‘popped’ my eye back in for cosmetic sake and I have worn a bandage lens ever since. I remember sister Butcher very well, she dominated the ward and was a wonderful person. I also remember some of the patients and a couple of ‘Guinea Pig’ patients still undergoing treatment and who would take me as an 18 year old then along to the Guinea Pig pub for a Guinness which was encouraged at the time. The night of my accident I was not expected to live for more than a few hours but due to the care of the Queen Victoria staff I am here today and I will always remember each and every one of them with the respect they all deserve. I was born with no tear ducts. My father, Group Captain R L C Fisher, an eye surgeon, and a great admirer of Dr Ben Rycroft took me in 1952 to see Dr Rycroft who successfully opened the ducts. I was only 11, terrified, as several previous attempts had failed. The joy of no more wet chapped cheeks.